In the wake of Minecraft, Cave Story and Spelunky, caves are quite a popular setting for indie games lately. They’re fascinating places to explore, brimming with mystery, danger and surprises, and these games capture that feeling. Little Caves has players drag their finger around the touch screen to direct a fly through a massive maze set in an ant hill. It’s a concept that could go either way, but in its execution here, there’s really only one way it goes. Down. Sadly, the game is simply not much fun. 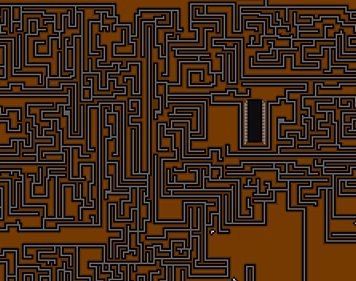 The mazes are crazily complicated, which you’d hope for in a game like this, but that doesn’t make them any more interesting to solve. The setting almost does, giving you some retro-pixel landmarks to gawk at as you twist and turn your way though the caves, but these are not quite common enough to hold your attention. Most of the time, you’ll be staring at grey tunnels on a brown background. When they do appear, their style and colours are very reminiscent of the kind of games I remember growing up, like Commander Keen, Biomenace and Lemmings. Unfortunately, nostalgia is no substitute for gameplay. There are times where these landmarks are incorporated into the mazes, and suddenly they become more interesting. 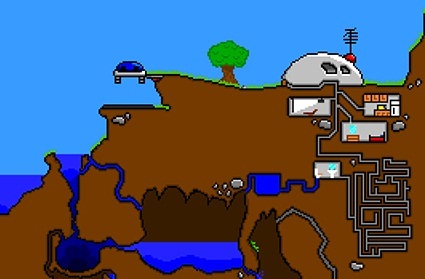 Travelling through water pipes to unblock a filter system that helps keep a whale alive in a bathtub dresses up the gameplay, rather than simply finding your way through grey underground tunnels. Perhaps the most clever part of the game is the control scheme. Wherever your finger is on the screen, a virtual thumbstick will appear. Moving your thumb relative to that will steer the character. It’s a handy way to bypass that major sticking point a lot of iOS games encounter, where the player’s thumbs obscure important parts of the screen. If your thumb gets in the way, simply move it to another part of the screen and keep going. 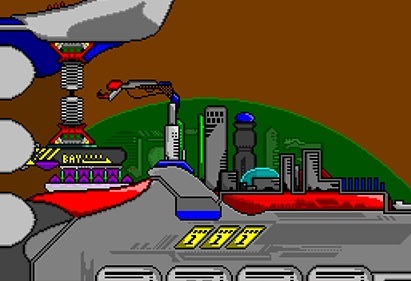 But the convenience of the controls is countered by their tendency to be fiddly: with the paths only just as wide as your character, you need pixel perfect precision to steer it down the right tunnel. Unfortunately, the game doesn’t offer pixel perfect control. Flicking the virtual thumbstick left to turn left doesn’t always result in a left turn. Sometimes a single flick can send the fly further up, into another corridor and twisted into a dead end before you know what’s happening. Or, you might be caught going up and down along a intersection, but the controls just won’t let you turn the corner. As mentioned, the visuals go partway towards livening up the gameplay, but not quite far enough to make the game palatable. The problem lies not with the presentation though: the set pieces look great, and I would like to be able to explore them in another format. But a game that’s fundamentally boring to play is always going to be, no matter how well you dress it up. The soundtrack doesn’t help the cause either. It’s at best a forgettable little ditty, and at worst a vaguely-ominous humming sound and dripping water. I ended up turning the sound off while playing. As difficult as the mazes are, the biggest challenge you’ll face in Little Caves is finding the motivation to keep playing it. With the flood of apps on the iOS vying for your hard-earned 99 cents, Little Caves is likely to be lost in the crowd. The game tries hard to be entertaining, but unless you really love mazes, it’s somewhat a losing battle. I’m not saying there’s anything wrong with mazes in general, but the ones on offer here are just rather bland. Don’t assume the team is out of the running just yet though. Record Set Shed have created a polished game with great visuals. If they spend time in their future games polishing something with a bit more meat to it, they might be one to keep an eye on.